X-Small - $88.99 Small - $88.99 Only 3 left! Medium - $88.99 Large - $88.99 Only 8 left! We're always hearing about Spider-Man and his origin story beginning from a high school kid on a field trip who happened to be bitten by a radioactive spider. Pretty soon he wakes up with super powers, and he figures out how to make webs in his basement. Not a bad beginning we suppose, but what about the lady spider? She's got a little more to offer. When Jessica Drew was very young, she grew incredibly ill due to uranium poisoning, forcing her father to inject her with his spider serum, and place her in an incubation pod. It decelerated her aging so when she was released from it decades later, she was only 17 years old. After that she used her powers everywhere from HYDRA to SHIELD and trained in espionage, private investigation, and all different forms of combat under the task master! If you thought Spidey was still smarter, the chamber she was in for decades fed her brain with all sorts of education over the years. As far as powers go, let's see the original webhead shoots concentrated venom bolts out of his hands to stun or kill enemies. That's what we thought. 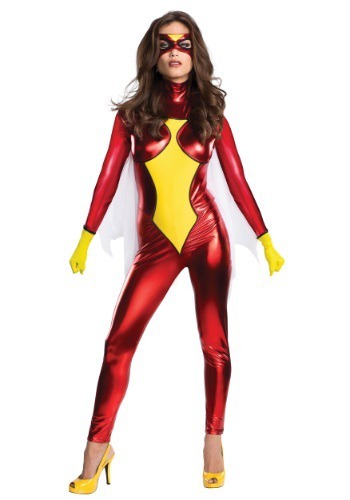 Not to mention the shining scarlet and yellow of her suit is equal parts intimidating and alluring. That second part might also be the pheromone she can produce to attract males to her. Think you're ready to fill those kinds of shoes? It's quite a resume, but we don't think you'll have too much trouble. This fantastic suit and mask will be able to scare off the street thugs with just a look. No superpowers necessary.